In 1985 and 2010 the Indian Government and the World Bank respectively conducted two different studies on how big the black or “Shadow Economy” of India is[i]. [ii] They both came to the same conclusion- it is around 20% of the total GDP. It is quite a surprising consistency over a quarter of a century. So, let us assume that this share of “black economy” in India is still around 20% of its nominal GDP. According to both the IMF and World Bank India now is the 7th largest economy in the world. According to the IMF the size of India’s economy is 2.25 trillion dollars. [iii] 20% of 2.25 trillion is 450 billion dollars. Before the last week’s demonetization the total value of liquid currency in India was around Rs. 16250000000000 or around 240 billion dollars. Rs. 500 and Rs.1000 notes which have been dropped as legal tender constituted 86% of this total amount which brings its value up to around Rs. 14000000000000 or around 207 billion dollars[iv]. 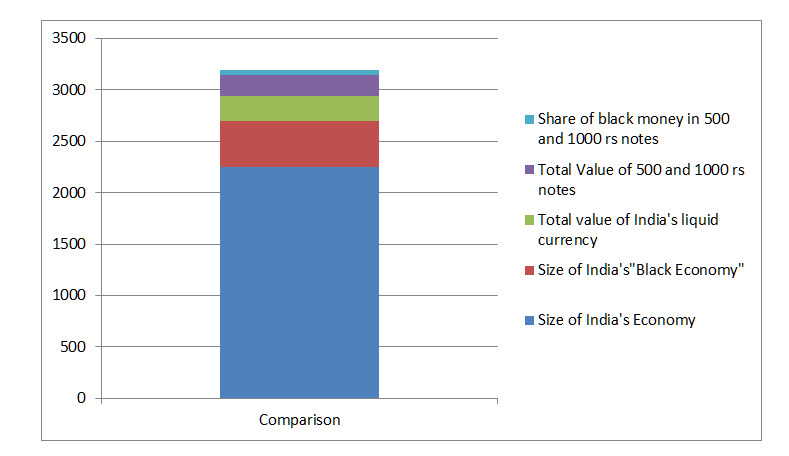 So, we see that the total value of the “black economy” is more than twice the total value of all the 500 and 1000 rupees notes. Now, let us consider that 20% of the 500 and 1000 rupees notes were “black money”. Even then, it will constitute only around 9% of what is generally considered to be the size of India’s “black or shadow economy”. Hence in conclusion, demonetization will not affect more than 91% of the “Black economy”. I like many other people have been quite critical of NDA2’s economic policies but we should not assume that the economic policies of our country is determined by “idiots”. Afterall, the Indian economy which was the 11th largest economy in the world last year is the 7th largest this year. So, they must have known that demonetization would affect only a minute section of the “black economy” so why go ahead with it? Part 2: Why then did the Government do it? When I look around myself post- demonetization – I see nothing but economic stress. Businesses are not selling anything, because the customers do not have enough legal tender to buy goods and services and I see lots and lots of people everywhere wasting hundreds of individual working hours by engaging in bureaucratic banking activities. So, I had to ask this question- why did the government impose such economic pain on the people and what was their cost benefit calculation? The conclusion I came to was simple- the government took this step to protect the fragile Indian banking sector against future volatilities caused by reasons like the US Presidential Elections amongst others. The “tier 1” capital is the capital set aside by banks under the Basel Agreements so that the banks can carry on with their business even after facing a financial calamity thus providing assurance of stability to customers. But as is clear from the above diagram this assurance is lowest in India amongst other leading Asian economies. 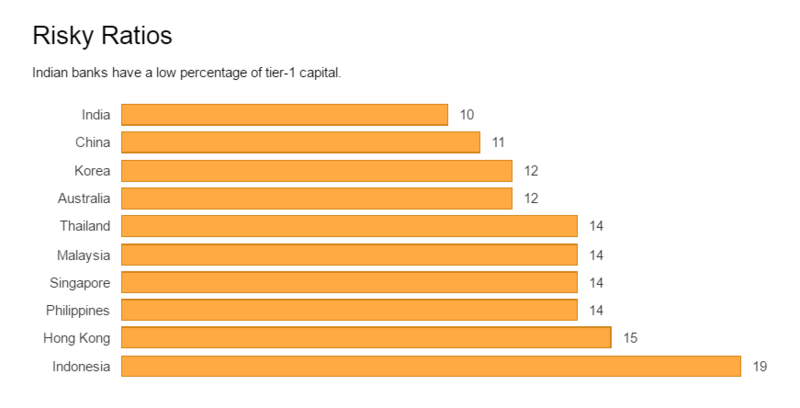 Also according to the Fitch ratings agency- Indian banks lack tier 3 capital as well. This capital is supposed to protect against tertiary risks like market risks and commodity prices risks[vi]. 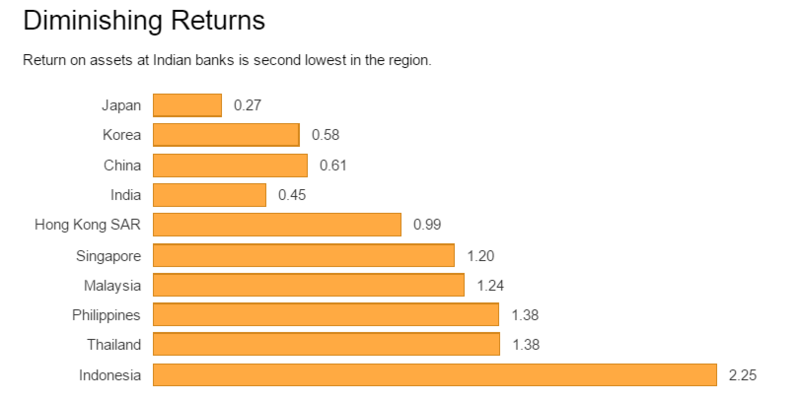 This figure shows that only Japanese Banks have lower returns on investments than Indian banks. Consider this- Japan has been going through not years but decades of recession and India is the fastest growing big economy in the world. The CRISIL ratings agency in March of 2016 downgraded the following banks- Bank of India, Central Bank of India, Corporation Bank, Dena Bank, IDBI Bank, Indian Overseas Bank, Syndicate Bank and UCO Bank[viii]. Standard & Poor’s ratings downgraded Syndicate Bank, Bank of India and Indian Overseas Bank in May 2016[ix]. ICRA ratings agency lowered the outlook for Bank of India, Indian Overseas Bank, Central Bank of India and UCO Bank[x]. What does the Reserve Bank of India think about this? According to the Reserve Bank of India, 14.5% of the total loans given out by Indian banks have become NPAs or stressed assets. This amounts to 7% of India’s total GDP or around146 billion dollars[xi]. How does the Government of India look at this problem? By all parameters the Government of India (GoI) also realises that the situation is quite grim. In 2015 the GoI began the “Indradhanush” plan to re-capitalize the banks by injecting 70,000 crore rupees by 2019[xii]. But this was not enough as the downgrades we saw above all happened after this plan had been launched. Now consider the above in the light of the results of the US Presidential Election where the Indian Government was staring at a possible Donald Trump victory- a person who made cancelling both intercontinental and regional free trade agreements with some of the closest allies of the US his central theme in the election campaign. Trump’s most significant foreign policy goal was to go back to the isolationism of 1920s and 30s something which aggravated the Great Depression. Whether these things happens or not, we will have to wait till the beginning of next year but, if that happens or even if there is an indication of that happening it would lead to tremendous pressure on the international markets including in India and since India lacks severely in tier 1 and tier 3 capital, its banks will not be able to sustain this pressure. So, what will happen after that? Let me answer this question along with the question I asked above- “But then why did the government just not tell people the truth?” (about demonetization). It was probably because both the situations will have led to the following consequences. People will rush to the banks not to deposit or exchange cash but to withdraw cash. Government will impose capital limitation over withdrawals (like it has done now- but with the crucial difference being that now it is due to increased demand and then it will be due to lack of supply of money). The people seeing that money is running out and they are not being allowed to withdraw a lot will start buying stuff in bulk and stocking them in their homes- leading to sky rocketing inflation. The RBI then in order to stop people from withdrawing money and to reduce inflation will increase the interest rates substantially. But this increase in interest rates will mean that businesses will not be able to borrow money to expand capacity or even carry on with day to day operations so many businesses will have to shut down leading to massive unemployment and social and political unrest. I am not pulling the above hypothetical scenario out of my hat- not only because I am not wearing one but also because we saw this exact same situation play out in Greece and Russia in the last few years after their financial institutions collapsed due to the Eurozone crisis and due to the Western sanctions respectively. So, it seems to me that the NDA2 government instead of dealing with this above mentioned hypothetical situation decided to deal with the consequences of demonetization. How this works out- time will tell but let us look at one of the immediate impacts of the “currency ban”. Remember the 70000 crore rupees the Indian government was planning to spend on recapitalizing our banks? Well, within just one day after demonetization was announced the State Bank of India alone received deposits worth 53000 crore rupees[xiii]. 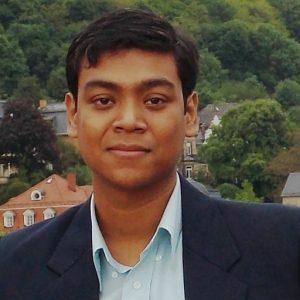 Also when I see the massive crowd in the banks lining up to deposit their now- worthless currencies I realise that probably the 70000 crore rupees target has already been crossed and by the end of this year the Indian PSU banks should have sufficient resources to deal with their stressed assets comfortably. So, the mission to recapitalize the banks is now a success. But was it worth the pain that we see the government inflict on the common people with demonetization? In conclusion I would like to just state something that the Lacanian philosopher Slavoj Zizek said in his review of the 2008 movie- The Dark Knight. So, (Spoiler Alert) Zizek said that the ending where the information about Harvey Dent turning into a villain is suppressed while Batman is falsely vilified in the stead so that people of Gotham have hope in a “brighter future” is a very neo-conservative way of thinking. The absurdity of this thinking is that the powers whom the people elected after judging them to be suitable for holding a post think that the people are too stupid to know the truth and hence it is suppressed from us. Previous A Review of Noam Chomsky’s interview with Mehdi Hasan and Can the terms “Liberal” and “Left” be used synonymously? Why did you assume 20% of 500 and 1000 notes are black economy? The world bank did not mention the percentage of black money is 20% across all asset class including notes. Secondly, why are the other benefits not considered in the article for the holistic view? like counterfeits notes and the dangers of counterfeits to the nation primarily is the terror sponsor. Lastly, why do you think this is the last step of attacking the black economy? I know 500 and 1000 rupee note is some part of black economy but this is not the last step. Why don’t you mentioned that banks are bleeding and there is minuscule returns on assets from long time and previous governments are equally responsible (if not 70-80% responsible) for that state of the banking system. Regarding why I considered only 20% of 500 and 1000 rs notes- it is because I was giving some leeway to the government. Most writers (including myself) think that at most it will be only 10% (for eg here: http://www.hindustantimes.com/india-news/why-govt-s-demonetisation-move-may-wipe-out-illegal-money-worth-rs-140000-00-00-000/story-adn8v35a3Kd6NtBHqXpOjP.html) – because as we see from the massive note destroying and hawala operations post demonetization- it is very uncomfortable to store black money in cash. Regarding terror financing- I know only what I am seeing on the ground- Naxalites are using innocent tribals to deposit their cash into their accounts. In the North East people are very afraid that extortion which had been reduced in the last 2 years due to reasons like govt negotiating with Naga rebels will restart again as now their currency has become garbage. An example of this new aggressive stance of the North East militants can be seen in what happened just 30 minutes back when ULFA attacked an army convoy (check the news). Finally, terror financing involves a lot of things like share market operations through shell companies, human trafficking, drug, gold and weapon smuggling which cannot be dealt with only by demonetization. Every article has a mandate and I cannot discuss everything and I have tried to stay away from politics as far as possible here. In fact I have given credit to the present government for recognising the problem and undertaking the Indradhanush plan, even though I think it was inadequate but something was better than nothing. Amongst other things that I have not mentioned here is also that the government has delayed the GAAR act which could have played a good role in reducing black money. Finally, I have not mentioned anywhere or even indicated anywhere that I think the demonetization step is the last step the government would take against black money- how you came to this conclusion is beyond me. Man, you so completely agree with me- that I don’t understand why you are criticizing me. I fully agree with you- how can black money be only Rs. 1400000000000? Thought provoking & masterpiece articl ,should be in newspapers for comments. Wow! I was certain that there is something that this government is trying to divert our attention from, but lacking any flair for financial analysis and knowledge of the reality of our banking system, I wasn’t able to work it out. Your article is a ray of light. I am gonna try and spread this information as far as I can. Sure! Even though I am no social media ninja, but will surely try to seed this as far as possible. Though after reading your article I must say that Govt got people to do exactly opposite of what they would have done, if Govt had told the real reason behind the demonetization. So in a way Govt intentions are in the right place. But from the looks of it, it is clear that our banking system needs an overhauling. I could convert the info you have presented in your article in form of a video essay with animated info graphics and visuals, if you allow. I think that would make this easier for a layman to understand and share. Sure, just send it to me once b4 posting it. Just wanted to add, that you sir are a genius!! Hahaha. Deposit is not capital what banks want to capitalize. Written without any study. Also there is no concept of tier3 capital now. Are you living in 2010 Mr. Regarding tier 3- No sir, Indian banks have been given the deadline of 2019 by the RBI in 2015 to meet Basel 3 or tier 3 requirements and they are running hither and thither to get it. In your first view where you said that 20℅ of total money is in 500 and 1000. That means you are saying 80℅ is in lower currency viz. 100,50,10,5,2,1. This is beyond realization. In Second view as you agreed it is assumption. Everything is not in Trump’s hand or he could do whatever he wants. There is a Senate and Congress which decides the policy and it entails discussion which will considers interest of everyone just the Trump’s. No Sir, please read my article carefully- I said 86% of all the money was in 500 and 1000 rs notes. Regarding Trump- I was thinking of the Ben Bernanke years as the head of the US Federal Reserve after the recession. Many a times he would say that he might think of increasing the interest rates in US and the global markets would tumble and in one such instance Indian bond market collapsed and there was a run on the Indian rupee and now we are stuck with the +-67 to 1USD situation. But Ben Bernanke never increased the the interest rates. If so much disruption can be caused by “nothing”, what will happen if Trump decides or tries to do “something”? I had made a similar guess too, but since financial terms and figures bog me down, couldn’t articulate as well as you have done. Kudos. It’s usually interference of IMF and world bank that creates recessions. And this demonetization has already started employment situation. Labourers are not getting jobs. No cash to pay. This is a strategy to reap benefits out of recession. It’s a very good insight about the demonetization. The moment should not be closed here and should be supported by other measures like making it mandatory to accept cashless transactions in all medium size shops and vendors. Provide enough education and security for the cashless transactions. Now when bank will have more money to give credit to the people, it should be controlled tightly now. NPA’s should not increase. More efforts should be made for the transparent transactions. I do not have much knowledge on the finance but thought of writing this with whatever i know. Great article man. The thing about all this that is happening is that there are too many factors that are at play that we do even realise. There are benefits and problems that will spring outta nowhere. One thing I do believe here is that this might weaken rupee coz now probably people holding onto black money will try to keep it in Dollars, which is quite the asset. Its well researched, great article! I applaud you for a well researched and reasoned summary of the underlying truth of the measure undertaken by the Government and RBI, in concert with the banks and big capital. How one wishes that the government of a democratic nation would learn to be transparent and accountable to its people! The sad truth is that in the Indian context, power and authority have always been seen as the means to exploit and loot at the expense of the public at large, and not as manifestations of the faith reposed and responsibilities assumed to work for the greater, larger good. How do we treat an ailment properly unless the symptoms and further dangers are fully shared and made known, and unless the treatment and subsequent precautionary and preventive measures are informed and understood to be necessary? Why should we be attempting to explain it away with such hype and hoopla? Shouldn’t we brace ourselves for a situation if the course of treatment embarked upon with such disinformation does not solve the problem, by taking all stake holders on board? I have a sneaking fear that the aim is to postpone, rather than resolve, the crisis in the banking sector. And to make hay while doing it! Honest &balanced apolitical information. Other debates on social media,political circles ,immature responses & dealing by authorities is creating division & fuelling frustration. Thanks bro for enlightening with financial aspects. I concur with few of your thoughts on this issue. I don’t how to explain in figure and graphs, but I did know that this was a strategy to strengthen the bAnks. One thing I strongly believe is, it may bring some chAnges in the coming future. May be banks would stabilize and could survive in any criticality. Lot of fake notes in the market will be eliminated. People will be forced to do more online transaction, well I could see lot of small scale vendors are having paytm mode of payments in their shops. Once people makes this as habit, this itself will become a key to white transaction. HAving said that certain security and education should be provided. I met few people who are ready to get the black money exchanged for 20 to 50% commission. Intern it has became a new window of opportunity for middle man to make money.. this should be taken care by government and strong punishment has to be given for these kind of people. 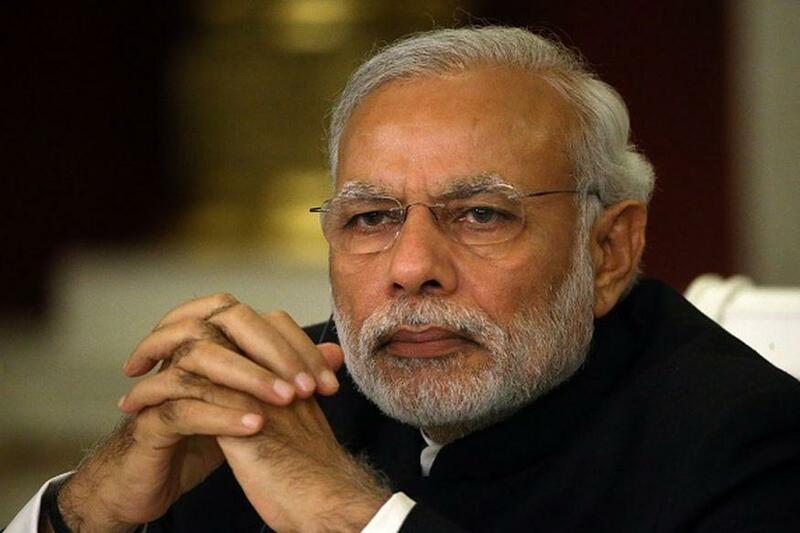 Tell me honestly, Sir, would this Government implemented this demonetisation decision, if it had expected even a fraction of the pain/stress informal sector is going thru and which is likely to continue in to next fiscal, even conceding your point that the Government faced a choiceless situation? Did the Govt. have a clue of the hardships vulnerable, marginalised sections of unorgained will face? Afterall, which Government, worth its salt, would jeopardise the fragile and precarious livelihood of crores of daily wage earners, migrant labour, small artisans , across the nation? I cannot claim to speak for the government. But yes, conceding your point the government did seem to underestimate the resultant pain which was especially visible from PM Modi saying that the “Poor are Sleeping in peace” after demonetisation- while the opposite was true. Also the timing was really bad due to two reasons- firstly it was during the rabi sowing season and secondly because it was before the most possible interest rate hike by the US Fed which will have further negative impact on the Indian currency. But the government must have made some macro-economic calculation like since more than 60% of India’s GDP comes from the service sector- growth rates would not be that badly impacted since important sections of this sector are immune to demonetization. Also, since more than 90% of the people have banks accounts now due to the Jan Dhan scheme and because government was targeting only 10% of the economy (total value of all the currency in circulation in India before Nov 8th) – the pain won’t be so deep. Also many governments both Indian and foreign have been known to have made tough decisions which causes short term pain but has long term advantage. Only time will tell whether this gamble of the NDA 2 government works out or not but for the time being the government should treat the immediate impacts of demonetization as a “national calamity” as Ratan Tata said few days ago and work on war footing to alleviate the problems being faced by the government. If you like my idea share it or if you have other ideas communicate them to the government.